So you’re stuck in the zombie mode. You’re not alone. I can’t say exactly when this fascination for zombies started for me, but I also have to say that it is a mixture of fascination and disgust. I guess that’s the best combination to get you hooked. In spite of my misgivings about reading, watching, or listening to anything zombie-related, I still continue to do so. 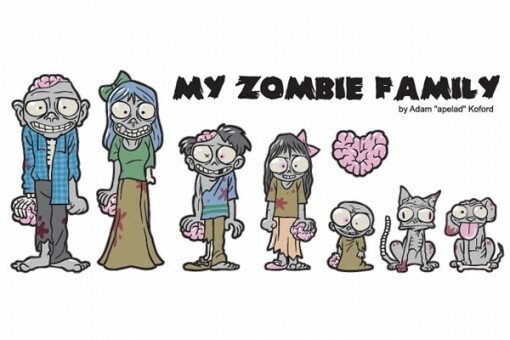 If you – and the rest of your family – have an affinity for the undead, then you will want to get your hands on this set of zombie family stickers. They are the perfect decoration for Halloween, which I assume you are getting ready for. 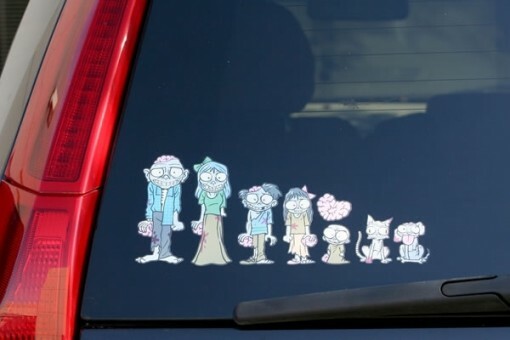 These zombie family stickers may not work with your costume, but they certainly will add that oomph factor to your car. Take a look at the stickers in action, and you will see what I mean. If you don’t have a car, I am sure that you can find alternative places to stick these on. I am sure the kiddos won’t mind having the stickers on their windows or walls. After all, it’s never too early to teach your kids about zombies. It’s better to have them knowledgable and prepared in event of the zombiecalypse! Oh, here’s another idea: they can be used as laptop decals! You want to know where to buy these stickers, I am sure. Head over to the Neatoshop, and remember, don’t be ashamed if you’ve got a family of zombies!